Part of the problem is that since 2014, councils have had to take on support for young people - up to the age of 25 - who are on special needs care plans, known as EHCPs. But councils say this extra duty was not funded properly.The union, whose members see pupils with unmet needs first-hand in class, says schools just do not have the money to fund support for pupils in the way that they need to do.Joint general secretary of the NEU Kevin Courtney said: "This is an appalling way to be addressing the education of some of our most vulnerable children and young people and is causing untold misery and worry to thousands of families. 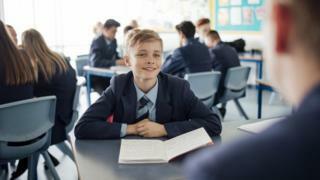 "The lack of funds has resulted in the loss of necessary support staff who help these children access education, increased waiting times for assessments and cuts to specialist provision, according to the NEU. Children and Families Minister Nadhim Zahawi said it was not right to imply that funding had been cut, adding that his department had increased spending this year on the high needs budgets for those with severe and complex needs.But families in North Yorkshire, Birmingham and East Sussex are taking central government to court over the way it provides funding to local authorities for special needs.The case is due to be heard in the High Court in June.Several local authorities are awaiting decisions after legal challenges were mounted over cuts to their special needs budgets.